Storyline: Ajith wants to unveil a scam and takes revenge on Home Minister and his companions who are involved. Nayan will be helping Ajith to catch the people. He kidnaps Arya for hacking the accounts of the home minister. Arya let police know about his kidnap and get Ajith caught by the police. From there it takes a new twist in the story and remaining wraps around why Ajith is chasing Home minister and his friends. 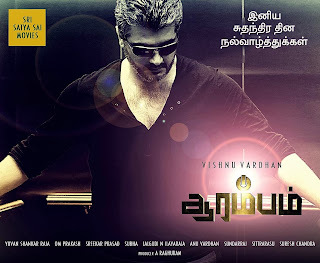 Review: This is an out-and-out Ajith's movie. He is the show stealer throughout the movie. His stylish acting stands as the highlight. This is certainly a film for fans. It contains whatever expects from their Thala. Screenplay would have been more gripping. Movie is not upto the expectations and no where near to Mankatha. Music Dept : Yuvan has composed 5 songs. Two of them were good. The theme of the movie was well composed. + Points : Ajith, background score(whenever Ajth walks). - Points : Dragging in few scenes,Screenplay. Suman Ranganathan made a comeback after 17 years into Tamil films. Bottom Line: Tik Tok Tik Tok...Whistle podu thala ki. Suggestion : Watch for Ajith.